I had a meal last night that I'm still thinking about today. Since following lusting after Ten Tables for months on Facebook, my bff Lucy, aka, Lulu, and I finally got dinner reservations. 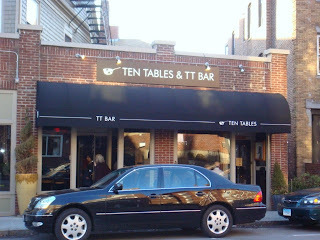 Located in Jamaica Plain (also in Cambridge and PTown), this gem of a restaurant was like balm on our week-weary souls. And, even better, we got the special reserved seats that abut the open kitchen so we could watch the talented and generous chefs who make that efficient little kitchen hum. I say generous because the crew of 3 were cranking out the meals on a bustling Thursday night, but still made time to chat with us and answer all of our questions about ingredients and recipes. Here's what we had: A charcuterie plate & mussels; Pan seared bluefish with a mixed grain salad, cherry tomatoes and Hungarian wax peppers; Natural hanger steak with cranberry bean and summer squash ragout and roasted romain and salsa verde; And for dessert: Hazelnut brown butter cake with blueberry compote with lemon verbena ice cream, and orange and bay leaf creme brulee. Oh, and a lovely rose. Crazy decadent, right?! Luckily, Lulu lives in JP, so we strolled, rolled home, me tottering up the hill to her house in my platform shoes. Fashion over function. 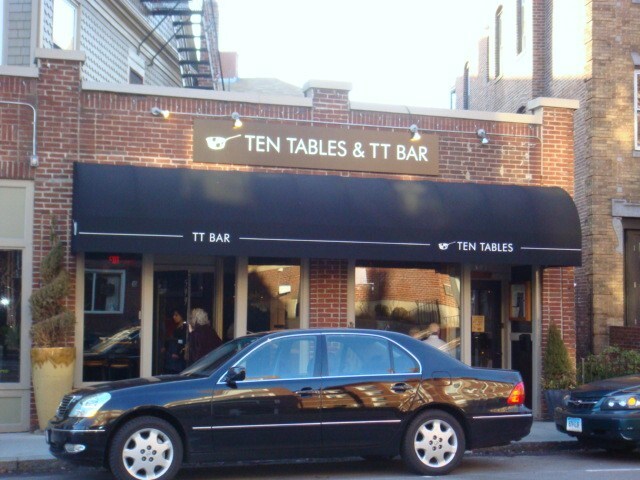 Check out Ten Tables if you want to treat yourself to top notch food (much of it from local sources), an impressive wine list, ambiance (small and candle-lit, the restaurant verily glows) and great waitstaff. Officially the Republic of Serbia, this landlocked country sits at the cross-roads of central and southwest Europe, covering the southern part pf Carpathian basin and the central section of the Balkans. Serbia borders Hungary, Romania, Bulgaria, the Republic of Macedonia, Croatia, Bosnia and Herzegovina, Montenegro, Albania, through Kosovo. Serbia's history is extremely complex, so this synopsis should not be considered complete. during the 7th century the Serbian's arrived in the Balkans, gradually evolving to become the Serbian Empire in the 14th century, then changing hands several times. 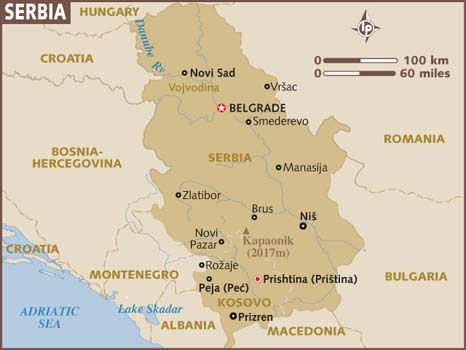 Between 1991-92, Slovenia, Croatia, Bosnia and Herzegovina and Macedonia seceded from Yugoslavia. In 1998, Slovidon Milosevic, the president of Serbia and Yugoslavia, waged a 79 day war against ethnic Albanians and the Kosovo Liberation Army (KLA), ultimately being charged with war crimes for unspeakable crimes against humanity, as well as corruption. 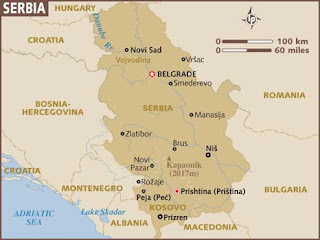 Serbia's southern province gained independence in 2008, but is not recognized unanimously by all international governments. For a more comprehensive overview, follow this link. Cuisine in Serbia is heavily influenced by Balkan, Mediterranean, Turkish, Central European, Austrian and Hungarian traditions. The country's rich, fertile plains and continental climate (except to the south that tends to be hot and dry and quite cold in winter), are ideal for growing grains, fruits and vegetables. Serbia is second in production of raspberries and plums after Russia and China, respectively. Pickled foods, sauerkraut, pogaca (flat bread), ajvar (vegetarian caviar), sausages, soups, roasted meats, lamb, pork and barbecue and rich tortes are all typical of the Serbian diet. Heat oven to 475 degrees. Place eggplants and peppers on a baking sheet with a lip to catch any juices and roast until their skins blister and turn black, about 30 minutes. Place roasted vegetables in a heatproof bowl. Cover with plastic wrap and let them steam for 10 minutes. Peel off and discard blackened skins, stems and seeds. In the bowl of a food processor, pulse until desired consistency is achieved (I like plenty of texture) Season with salt and pepper. Add garlic and lemon juice, and drizzle in olive oil. Pulse once or twice to blend. Transfer to a glass dish and sprinkle with parsley for garnish. Store covered in refrigerator for up to 1 week. In the bowl of a stand mixer, fitted with a bread hook, add remaining ingredients. Mix to a medium dough. Divide into thirds. Roll to fit size and shape of 8" or 9" cake pans (lightly greased). Brush dough with beaten egg and prick dough all over with a fork. Bake for 20-25 minutes at 425 F until golden brown. Final Assessment: Whoa! If you've never made roasted Ajar "caviar" before, please do. Not only is it easy, but it's well worth the little of time it takes to roast the eggplant and peppers, which are bountiful in stores and local New England gardens this time of year. The flavor is rich, roasty (yes, that's an adjective, Webster just isn't hip to it yet) and sweet. It's a little like baba genoush, but prettier because of the addition of red peppers. It was so good, we ate it right out of the food processor bowl with spoons. Later on, I made a chicken cutlets and pasta for the dudes in my house, and we spooned it right onto of the hot pasta. The pogaca is kind of like dense pita bread - simple, peasant style bread that is best torn into pieces, warm from the pan. Sprinkled with a little sea salt and dipped in the ajar, it's a lovely appetizer or vegetarian meal. I have some left over, which I'm planning to spread on toasted flat bread for breakfast. You may have just found the perfect recipe to get my eggplant-hating husband to try it! I think you already know that I will be spending the morning, with a cup of coffee, reading through your cooking adventures and enjoying each and every one of them! I have to ask, though, with you living in the Boston area, do you ever come across ingredients that you can't find? Do you have to order anything online? I have a wonderful friend in Switzerland who sent me a book for my birthday this summer about substitutions and it has saved my life! It's called The Substitution Bible and it even has a sub for smoked zebra...LOL! I guess you and I would know what that's about!! I really enjoy your pictures, as well. Wow! The substitution bible, that's awesome!! So, I think your husband would love this - my kids did and they don't like eggplant either. It's really rich and so easy to make! It's national dish in Macedonia... Whole country would have fumes in September - people gathered in backyards roasting tons of red paprika. Now it's bit more industrial production, but nevertheless superb. Thank you, Kirev! I love, love, love your description of the preparation in September - I can almost smell it! I so wish I could visit your beautiful country and experience it for myself! In the meantime, I'm grateful for generous readers like you who share share their stories with me. Best to you! Actually Ajvar is the most famous Macedonian dish, Macedonians make this dish every September and October, and we serve ajvar till the spring. It is the most delicious thing made from red peppers ever. We usually serve ajvar with cheese (i prefer macedonian type of cheese called kashkaval), olives, ham, homemade bread and tea or yogurt. For Macedonians the ajvar is more then just a dish,at the begining of fall you can feel the red pepper smell in every part of Macedonia. Every family member participate in the preparation of the ajvar which usually last two days. It is amazing meal. Greetings from Macedonia! Thank you for the interesting history on this wonderful dish. Aside from getting to sample food from around the world, I absolutely love hearing from people like you. I very much appreciate you taking the time to write me!